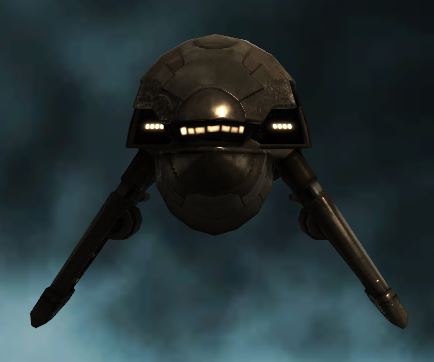 Why does my Cynabal have Sunglasses? Or the Dominix a fat man? Why does the Punisher have the big, toothy grin and face of a dolphin? The case of pareidolia in Eve is, I suspect, a mixture of subconscious and conscious decisions by the artists that have crafted the environment. The fatman for instance is a conscious decisions. An easter egg of sorts. While the Punisher suggests to me a more subconscious representation of something. An image seen and created and maybe by intent or just a natural tendency to lean towards imagery that draws us in. Then, some will just be the result of the players natural tendencies. The arc of a nebula or the angle of an object. Yet, because each and every thing in game was entered by another person it gives credibility to the surfacing of pareidolia to be not just random fancies of our imagination but a reflection of the random fancies of another persons mind now shared with us. Eve's artwork is amazing. There is so much meticulous attention to detail that the easter eggs such as the fat man on the Dominix hull are almost startling. Which is the point. That touch of fun speaks volumes about everything good in the game. The mixture of seriousness and humor that creates such an interesting demographic. The faces are not everywhere in everything. Some of it is simply an aspect of symmetry. After all, is this Megathron really a glowing eyed alien with an open, hungry maw? Of course I can state myself as charting towards the imaginative side of the scale. After all, I do write the Origin of a Spaceship entries. When I lived in Derelik I noticed the station that we lived in looked like a Coyote head or perhaps, Anubis. I pointed this out and I was promptly called crazy. I tried to explain to them that they needed to spin the station to see it. I was still called crazy. 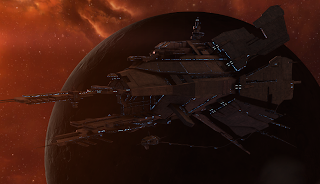 For those that wish to look this is the same station as Jita 4-4. 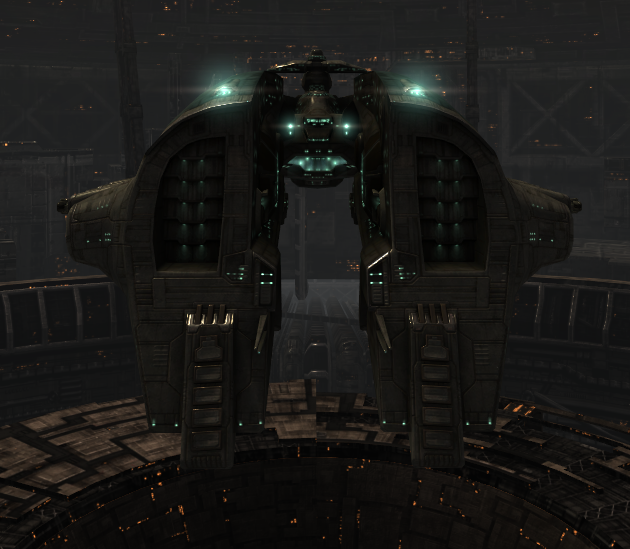 It is a Caldari Administrative Station. So I went to find a profile of a coyote or Anubis. I wandered onto deviant art and when I searched for Anubis I found quite an interesting selection if very stylized, techno-fiction looking canine profiles. Maybe my creativity is to much but I cannot help but see this particular image. And others seem to see this style enough that this particular station makes me wonder if it is me or if I simply see what someone else created. 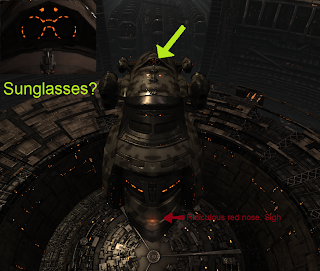 It may be the four eyed horned demon of a Davedevil or the cute fishy shape of a Caldari Shuttle but the things in Eve have faces. Cute ones, obvious ones, and hidden ones. Also the Vigil is a person (http://interstellarprivateer.wordpress.com/2010/08/23/dark-side/vigil-smile/), and the same Caldari "coyote" station you mention has a bunny rabbit on it. 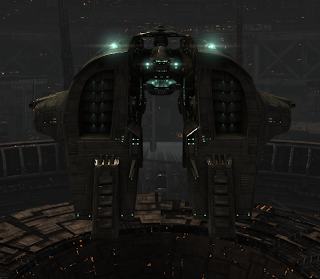 Sugar, I keep telling people that the Caldari station looks like the transmission from a car.